An investigation has revealed disturbing and inhumane treatment of pigs as they are transported for slaughter at a Canadian processing facility. 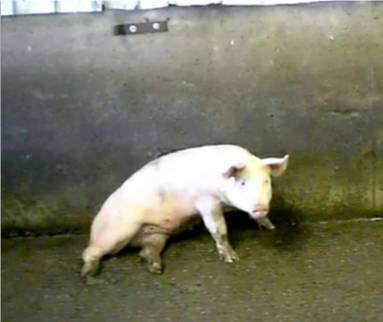 With video captured on hidden camera, CTV’s W5 reveals how staff at a federally-monitored Alberta pork plant are captured on camera abusing animals. Workers at Western Hog Exchange in Red Deer, Alta. can be seen using plastic bats to force pigs to move through crowded and overflowing pens. The video recorded by Mercy for Animals Canada also shows facility workers forcing pigs that can barely walk to move by using electric prods and shoving them with gates as they are forced into their pens. While the facility is federally monitored, inspectors from the Canadian Food Inspection Agency can be seen on the undercover footage oblivious to the abuse or even supplying plant workers with electric prods for use on the pigs. A copy of the plant's manual tells employees that prods are not to be used in the barn to move hogs. At one point, as dead pigs are hauled off a trailer, a CFIA inspector can be heard saying: "If anybody has a camera, this’ll be on the Internet." When shown the video recording, animal welfare expert Temple Grandin told W5 the treatment isn’t just unacceptable and inhumane, but would be a violation of U.S. Department of Agriculture rules in some cases. EDMONTON — A Canadian organization dedicated to preventing cruelty to farmed animals is calling for action from the Federal Government after a hidden camera investigation revealed pigs being beaten and kicked by staff at a Red Deer hog farm. The non-profit group Mercy For Animals Canada (MFA) has released undercover video captured at Red Deer’s Western Hog Exchange. The video shows hogs repeatedly kicked, beaten with bats and stepped on. The video also shows a staff member dragging a hog out of a transport truck, allegedly while a Canadian Food Inspection Agency inspector was watching. Injured animals can be seen with open wounds; some struggle to walk. The footage shows staff members shocking pigs with electric prods and shooting the animals in the head. Staff members are seen using bolt cutters to break through the tusks of the pigs. MFA provided the following video footage to Global News. Global edited the footage to remove the more graphic scenes. The video in its entirety can be viewed on MFA’s YouTube channel. In a statement released on its website, Western Hog Exchange says it takes responsibility for what happens at its facilities. The company says it has launched an independent investigation with third-party experts in animal care and transportation. “Many of the images we saw on the video were shocking and disturbing, and they are not in keeping with the animal care training and policies in place at WHE,” said WHE chairman Brent Moen. “It’s clear that we need to do better – and you have my word as Chairman that we will do better.” “The care and handling of animals is a responsibility we take seriously, and it is paramount that our shortcomings related to animal care are dealt with immediately,” said Moen. The CFIA says it has also launched an internal review, following allegations an inspector was on site while the alleged animal abuse was taking place. “CFIA management has met with all inspection staff in the area to reinforce our values of courage, rigour and respect. We have also taken this opportunity to discuss with staff our ongoing expectation that animal welfare responsibilities be carried out in a compassionate and respectful manner,” reads a statement posted to the CFIA’s website. MFA is calling on the Federal Ministry of Agriculture to take immediate action to modernize Canada’s livestock transport regulations to prevent abuse. MFA was also behind a hidden camera investigation earlier this year at a B.C. dairy farm.